“People don’t take trips. Trips take people,” once opined John Steinbeck. Meaning: your journeys may head in unexpected directions — but they tend to do so with unexpectedly awesome results. Now, you have a couple prime weekends left for road trippin’ this summer. This is where Outdoorsy comes in. Just launched nationwide, Outdoorsy is Airbnb for recreational vehicles. There are 11 million RV owners in the U.S. But most of those Airstreams and ‘Bagos are sitting idle. 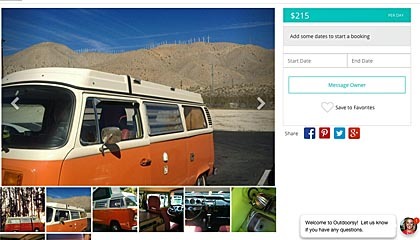 Outdoorsy lets you rent them. Just pick your preferred RV (Class A, B or C, travel trailer, pop-up camper, etc. ), number of guests, destination and budget, and you’re set to go. New to the RV game? They’ve got some good advice. Some owners’ll even rent you additional accessories, like canoes or bikes. Just note you will need insurance, and owners can be choosy (just like Airbnb). Good news is, you can save between 10-60% off your trip taking an RV, and you’ll have roadside assistance to boot. Plus: a real bed, TV and kitchen at your disposal. Own an RV? Outdoorsy claims you can make up to $86,000 a year renting it out. That’s what we call taking someone for a ride.